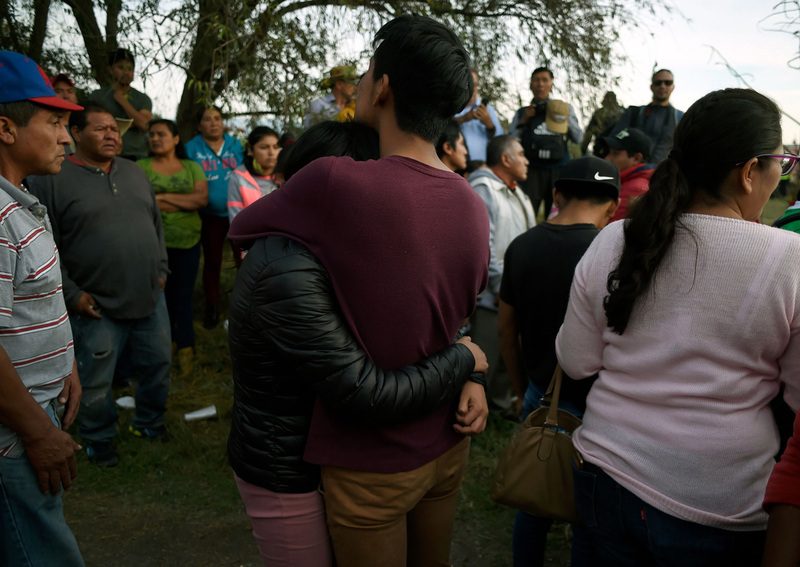 TLAHUELILPAN, Mexico - An explosion and fire in central Mexico killed at least 73 people after hundreds swarmed to the site of an illegal fuel-line tap to gather gasoline amid a government crackdown on fuel theft, officials said. 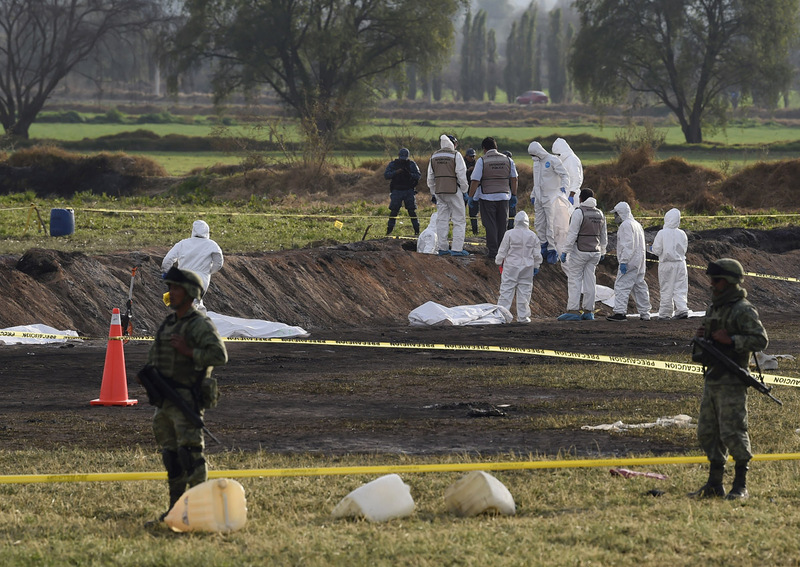 The blast - which Fayad said injured 74 people - occurred near Tlahuelilpan, a town of 20,000 people about an hour's drive north of Mexico City. As soldiers guarded the devastated, still-smoking scene, forensic specialists in white suits worked among the blackened corpses - many frozen in the unnatural positions in which they had fallen - and grim-eyed civilians stepped cautiously along in a desperate search for missing relatives. When the forensic workers began attempting to load corpses into vans to be transported to funeral homes, some 30 villagers tried to stop them. They demanded their relatives' bodies, saying funeral homes were too expensive. The bodies were ultimately taken to a morgue, authorities said. On Friday, when authorities heard that fuel traffickers had punctured the pipeline, an army unit of about 25 soldiers arrived and attempted to block off the area, Defence Secretary Luis Crescencio Sandoval told reporters. But the soldiers were unable to contain the estimated 700 civilians - including entire families - who swarmed in to collect the spilled gasoline in jerrycans and buckets, witnesses said. President Andres Manuel Lopez Obrador, a leftist who took office only weeks ago, travelled to the scene early Saturday. He did not fault the soldiers, saying, "The attitude of the army was correct. It is not easy to impose order on a crowd." He vowed to continue fighting the growing problem of fuel theft. The US Secretary of Homeland Security, Kirstjen Nielsen, tweeted that her department "stands ready to assist the first responders and the Mexican government in any way possible." Video taken in the aftermath showed screaming people fleeing the scene as an enormous fire lit up the night sky. The tragedy comes during a highly publicised federal government war on fuel theft, a problem that cost Mexico an estimated US$3 billion (S$4 billion) in 2017. Acting attorney general Alejandro Gertz described the latest disaster as "intentional" because "someone caused that leak. And the fire was a consequence of the crime." But he acknowledged that investigators would be hampered by the fact that "the people closest to the explosion died." The fire had been brought under control by around midnight Friday, the security ministry said. Fayad said that two hours after the pipeline was punctured, "we were informed that there had been an explosion" and the flames "were consuming everything around." But the strategy to fight the problem led to severe gasoline and diesel shortages across much of the country, including Mexico City, forcing people to queue for hours - sometimes days - to fill up their vehicles. The president, who took office on Dec 1, has vowed to keep up the fight and asked Mexicans to be patient. "A lot of people arrived with their jerrycans because of the gasoline shortages we've had," said Martin Trejo, 55, who was searching for his son, one of those who had gone to collect the leaking fuel. The roots of the fuel theft problem run deep in Mexico, where the practice - known locally as "huachicoleo," or moonshining - is big business for some communities.